Sheila Clemmons Lee, left, and Vickie Hambrick have bonded through their grief: They support each other as they each grapple with their sons' deaths. The indictment of a Nashville police officer, Andrew Delke, for fatally shooting a young black man, Daniel Hambrick, is the first time in the city’s history an on-duty officer has been charged with murder. A year and a half earlier, the high-profile shooting of Jocques Clemmons by another Nashville officer did not result in a trial. Police advocates say both officers followed their training and acted in self-defense because Hambrick and Clemmons had guns. The similarity of these cases has brought together the mothers of the two men who were killed, both of whom say their sons shouldn't be painted as criminals. Vickie Hambrick and Sheila Clemmons Lee both had their sons fatally shot by MNPD officers. Last July, Sheila Clemmons Lee heard about Daniel Hambrick, who had been shot and killed by Delke. Lee said she wanted to meet Daniel's mother, Vickie, and offer help. 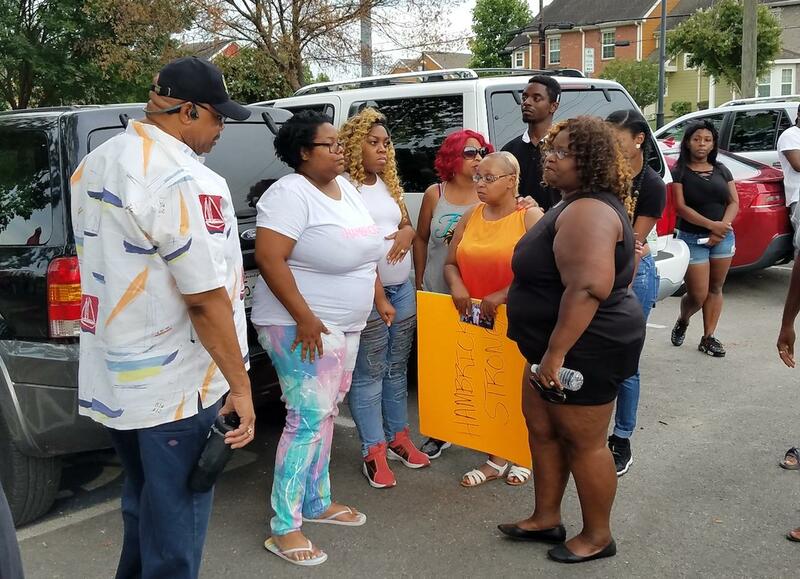 As the mother of Jocques Clemmons, who had been shot and killed by Nashville officer Joshua Lippert in 2017, she said she knew what Hambrick would be feeling. "It was at the first vigil, right across from where Daniel was murdered. That's where we met," Clemmons Lee said. "I wanted to support her, and I let her know she wasn't in this by herself, that I was right there with her, and that I would fight every step of the way with her." In the first days after her son's death, Vickie Hambrick says she worried she wouldn't have anyone to support her. She doesn't have a husband, and Daniel was her only son. He was also her caretaker: Vickie is legally blind and relied on him for everything from paying the bills to bathing. But, when she met Clemmons Lee, "she lifted my spirit and knew what I was going through," said Hambrick. Since then, Hambrick and Clemmons Lee say their relationship has blossomed. They talk often on the phone and go to community meetings together. They say they feel part of the same family and that their sons are "kindred spirits." Hambrick says she was at home when she received news that Officer Delke had been indicted on first-degree murder for shooting her son. She immediately called Clemmons Lee, who had heard about the indictment from a reporter. "I knew why she was calling, but I wanted to hear it from her. We were just sitting there on the phone praising god. The two of us were like, 'Yes, our sons are going to get justice,' " said Clemmons Lee. Sheila Clemmons Lee, in black, first met Vickie Hambrick at a vigil for her son in July. Clemmons Lee and Hambrick both say they felt their sons have been unfairly painted as criminals. "My son is not bad, like they are trying to paint his picture to be. Everybody makes mistakes. Nobody is perfect but God," said Hambrick. "I know they said he had a gun, but ... they still shot him down like an animal." "You can't use their background as a reason why you kill them," Clemmons Lee said. Clemmons Lee admits it's been hard to reconcile with the fact that her son's case never made it to trial. But, she calls him a "sacrifice for change." Since his death, there have been several changes, including an agreement signed by the Davidson County District Attorney's Office, the Metro Nashville Police Department and the Tennessee Bureau of Investigation that puts the state agency in charge of investigating all fatal police shootings in Nashville. She has also strongly advocated for a police oversight board, which is now forming. Clemmons Lee says those steps help fulfill a pledge she made to Jocques after his death. "Don't think I'm crazy, but I did have a conversation with him, and he told me he was OK, and he needed me to go on with my life. The next family hasn't gone through what I went through," said Clemmons Lee. "I managed to do what I set out to do. And that's to pave the road to where they won't have to work so hard to fight so hard." Hambrick believes Clemmons Lee has helped her son's case move forward, which she sees as having broader significance. "If I get justice, Jocques gets justice. All the rest of the family members get justice — the ones that lost their loved ones to the police," said Hambrick. "Daniel's case is Jocques' case," she said.